Tamil Nadu Public Service Commission (TNPSC) recently released the Group II Recruitment Notification and conducted the Preliminary Examination for the same during the month of November 2018. It is expected that TNPSC to release the Group II Prelims Exam Results in upcoming weeks and we are expecting about 90% of our students to clear this Prelims Examination. By keeping that in mind, our TNPSC Dept Staff have sharpened their Sword for the TNPSC Group 2 Mains Examinations. Our RACE TNPSC Team members have planned to start “a Full-fledged TNPSC Group 2 Mains Coaching” for the TNPSC Students who believe on clearing Prelims Examination. 1. Classes will be handled by our expert Team that includes GOVT Officers. 2. Weekly Two classes and one test will be conducted up to Prelims Result. 3. Key Points for every test will be given in Bilingual. 4. Most of the Exams are Mock Examination conducted for 300 marks, consisting TNPSC Pattern Questions. 5. Test Review will be given in 7 days from the commencement of exam. 6. Each and every student will be mentored by Our expert team. 7. Special Material focussed on TNPSC Group 2 Mains Examination will be provided. 8. More than 40 Full-Length Mock Exams will be conducted in due course. Only RACE TNPSC Students (from any branch) can attend this Program at FREE OF COST. The TNPSC Group II Mains Coaching will be conducted in Chennai & Madurai Branches only. Those who want to join this Program from other Branches are advised to reach Chennai / Madurai on 5th Dec 2018. 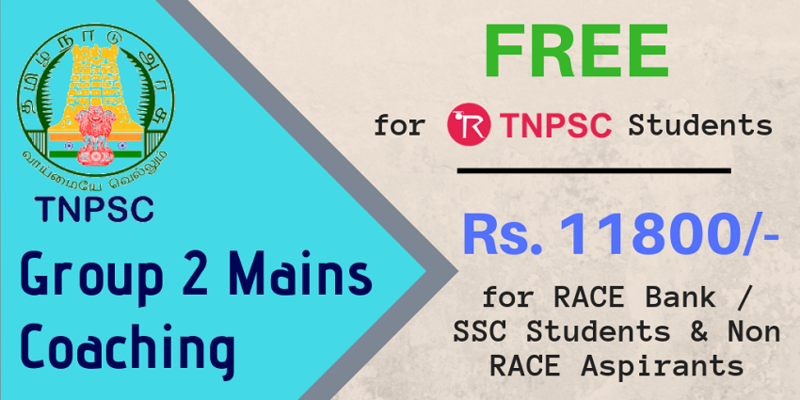 Note: RACE Students who wish to attend the TNPSC Group II Mains Coaching (Paid / Free) should bring the following documents to get access to the classroom. Students who fail to produce any of the above documents will not be permitted to attend the class. TNPSC Group II Mains Coaching will be conducted in Chennai & Madurai Branches only. Note: Non-RACE Candidates who wish to attend the TNPSC Group II Mains Coaching in RACE Institute should bring the following documents to get access to the classroom. Next TNPSC Group II Mains Batch will start after TNPSC Prelims Result Date. Want to Crack TNPSC Group II Mains Exam?